A plethora of new coffee table books and special issues dedicated to Edward Hopper are popping up all over Paris on the occasion of the artist's first large-scale retrospective in the French capital. While this major reappraisal of one of the greatest American painters of the last century (and at the Grand Palais, that overwheming bastion of French grandeur) can only be cause for joy, it is somewhat difficult to find a fresh take on the subject, and so far only Les Inrockuptibles, this country's most discerning cultural weekly, has managed to surprise and delight. The Edward Hopper : from Painting to Pop Culture special issue thankfully steers clear of the "Hopper for Dummies" facts and figures too often seen elsewhere in favor of an omnivorous and highly engaging survey of Hopper's legacy. The focal point here is the aesthetic ethos of "loneliness and the decay of the American dream" and its unique resonance across generations and art forms, from litterature to cinema and from photography to music. 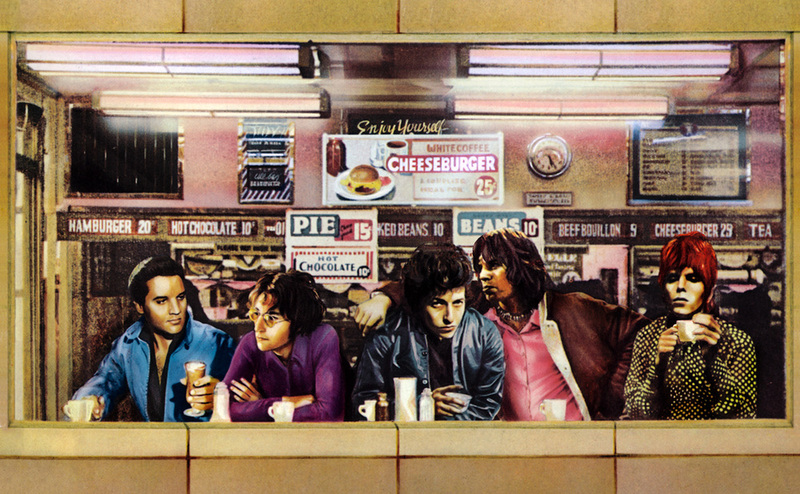 One of this publication's happiest surprises is a sharp essay by editor-in-chief Serge Kaganski exploring the Hopper / Peellaert filiation, entitled Rock 'n' Roll Solitude and drawing interesting parallels between the iconic diner from Hopper's 1942 painting Nighthawks and Peellaert's classic 1973 cover image for Rock Dreams, which uses a similar location while replacing Hopper's anonymous and solitary cast of characters with the cream of rock artistocracy : Elvis, Dylan, Jagger, Bowie and Lennon, all of them no less human, alienated and alone despite their status as divinities. Kaganski goes on to examine what remains Peellaert's most deliberate homage to Hopper : the Las Vegas, The Big Room collection of portraits, produced over 10 years from 1976 to 1986, where emblematic figures of the Las Vegas mythology (Bugsy Siegel, DiMaggio, Sinatra...) are depicted in various states of loneliness, whether actually alone or interacting with other characters. 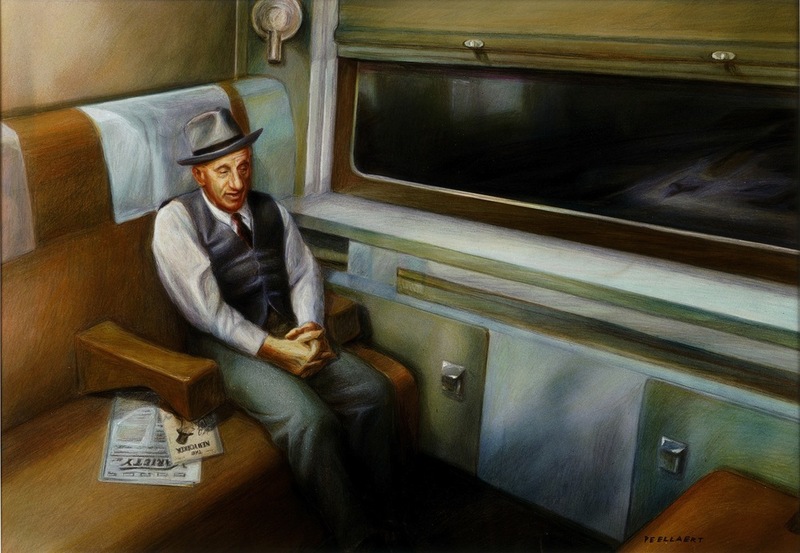 A reproduction of Goodnight, Mrs. Calabash, Peellaert's 1978 portrait of Jimmy Durante riding a night train in an otherwise empty wagon, indeed calls to mind the singular mood and composition of Hopper's Compartment C, Car 293, absent from the Grand Palais exhibition but nevertheless featured at the beginning of this special issue. Guy Peellaert, Rock Dreams, 1970-1973. Edward Hopper, Compartment C, Car 293, 1938. Guy Peellaert, Good Night Mrs. Calabash (Jimmy Durante) 1978. In other Inrocks-related news, 50th birthday girl Marilyn Monroe was also the subject of a special issue earlier this year : Marilyn, Beyond the Icon provides an insightful study of the ever-lasting power of projection of Marilyn—the self-created image—on visual artists ranging from Warhol to Banksy. The selection includes Peellaert's striking 1994-1999 vision of the star, a tongue-in-cheek revisionist theory that shows Marilyn found dead at a ripe old age (the headline-grabbing suicide of 1962 had all been a sophisticated sham!) in a very modest setting, surrounded by various mementos from glory days that just might give away the identity of this dignified but anonymous old lady, whose head is covered by a heart-shaped pillow in a final attempt to conceal her indelible former image. Frustratingly, there is no mention of Peellaert's Hitchcockian cameo as one of the puzzled police officers examining the body, all the more regrettable given the significance of the Marilyn motif throughout the artist's life : as a 20-year-old Belgian soldier supporting the US military in Korea, Peellaert was among the faces in the crowd when the most famous and desirable woman on earth gave her well-documented concert to entertain the troops in February 1954, wearing a skimpy black dress in the freezing cold. There is a reason why, as the article points out, the artist would later describe Marilyn as "the initial attraction". Guy Peellaert, Marilyn Monroe, 1994-1999.